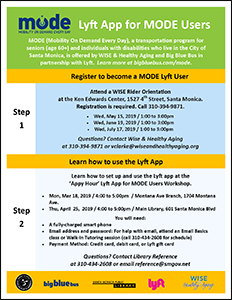 Big Blue Bus and WISE & Healthy Aging have partnered with Lyft to introduce Mobility On Demand Every Day (MODE), the City of Santa Monica's shared-ride service for older adults and persons with disabilities. The MODE program provides members with greater options for freedom and mobility, by offering curb-to-curb, on-demand transportation, convenient payments, and much more. For more information about the program, download the MODE brochure below. Eligible participants must register with WISE & Healthy Aging prior to using MODE; see How to Register for more details. Proof of Supplemental Security Income (SSI) or Social Security Disability Insurance (SSDI) benefits (present benefit/ verification letter). MODE does not operate on New Year's Day, Martin Luther King Jr. Day, Presidents' Day, Memorial Day, Independence Day, Labor Day, Thanksgiving Day, or Christmas Day. A one-way fare for MODE members traveling in either a Lyft or wheelchair vehicle is $0.50. Members may travel with up to one (1) companion or one (1) personal care attendant, at an additional cost of $0.25 per ride. Payments can be made through your Lyft account, with either a credit, debit, or prepaid card; your card will automatically be charged $0.50 (if traveling alone) or $0.75 (if traveling with a companion or personal care attendant) after each eligible ride. Wheelchair and door-through-door members must pay for eligible rides in advance by cash, check, or credit card at Blue: The Transit Store only; see Passenger Accessibility for more details. MODE also offers twice monthly shopping trips and other excursions, available by reservation only. Please phone the MODE Call Center for dates and availability. To be eligible for the MODE program, you must register at a MODE orientation session. For details on upcoming sessions, please contact WISE & Healthy Aging at 310.394.9871. Monthly orientation sessions will be held at the Ken Edwards Center (1527 4th St., Santa Monica, CA, 90401); caregivers and relatives are encouraged to attend. For more information, please call WISE & Healthy Aging at 310.394.9871. Valid government issued picture ID: State ID or driver's license, or passport. Proof of Santa Monica residency: Address on valid ID, gas or electric bill dated within three (3) months, or letter from the Housing Authority verifying assistance dated within one (1) year. Intended form of payment: Credit, debit, or prepaid card is preferred. Please bring check or cash ($5 minimum) to pre-pay for rides on the wheelchair van. Your fully charged iPhone or Android smartphone device if you have one. Under the Economy tab, choose Shared, then tap Select Shared. Confirm the number of passengers for the Shared ride, by tapping 'Just me' (if traveling alone), or 'Me and a friend' (if traveling with a companion or personal care attendant). Identify yourself when your Lyft driver arrives, then enter the vehicle and buckle up. While in route to your destination, you may be paired with a new passenger(s). Your route and estimated arrival time will update in real-time, as other passengers are scheduled for pickup. Download our MODE Quick Guide for detailed instructions on how to use Lyft on a smartphone, computer, or mobile browser. Please note: Members without a smartphone, computer, or credit, debit, or prepaid card, can phone the MODE Call Center (310.458.6633) to schedule a pickup. Wheelchair and door-through-door members may phone the MODE Call Center (310.458.6633) to schedule same day pickup in a wheelchair van, or make a reservation in advance. * Reservations must be made one to seven days prior to the date of travel. All reservations are booked on a first-call, first-served basis, regardless of trip purpose. *Please note: Saturday and Sunday trips are available by reservation only, and must be reserved at least two days in advance. The term "wheelchair" means, a mobility aid belonging to any class of three (3) or more wheeled devices, usable indoors, designed or modified for and used by individuals with mobility impairments, whether operated manually or powered. MODE requires all passengers to wear seatbelts, including passengers in wheelchairs/scooters, at all times during the ride. Drivers may assist passengers to secure the lap belts to ensure the customer's safety. Drivers will secure all wheelchairs/scooters in the proper wheelchair position on the vehicle. If a passenger refuses to wear a seatbelt or secure their wheelchair/scooter, they may be denied service. Most MODE vehicles are designed to accommodate wheelchairs up to 30 inches by 48 inches. However, we will transport larger mobility devices, if they can be safely accommodated on our vehicles. A wheelchair must be able to maneuver and fit properly into the wheelchair position on the vehicle and be secured. Wheelchairs that cause legitimate safety concerns, such as an oversized wheelchair that does not fit properly into the wheelchair position, or interferes with the safe evacuation of passengers in an emergency, will not be accommodated. 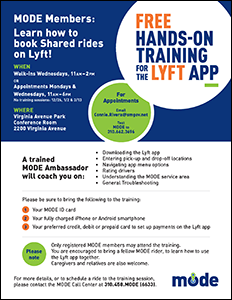 Big Blue Bus offers free, hands-on training on how to use the Lyft app for registered MODE members. See below for details on upcoming training sessions, or contact the MODE Call Center at 310-458-MODE (6633). Lyft is an on-demand ride service that matches you with a nearby driver who will pick you up and take you to your destination. Rides are requested using the Lyft mobile app for iPhone and Android smartphones, or online with a Lyft account. Can I use my existing Lyft account on MODE? Yes. Please provide the email address and phone number associated with your existing Lyft account where indicated on the MODE application (enclosed); a discount code will be applied to your Lyft account within five (5) business days of your completed registration for MODE. I have a credit card, debit, or prepaid card, but do not have access to a smartphone. Can I still request a ride on Lyft? Yes. Members unable to use the Lyft mobile app can instead request rides online. Simply visit ride.lyft.com on your computer or mobile browser to request a ride. Please note that you must have a mobile phone capable of receiving text messages to request rides online. I do not have access to a smartphone or credit, debit, or prepaid card. Can I still request a ride on Lyft? Yes. Members without a computer or smartphone must phone the MODE Call Center to schedule a pickup, and may pay for rides in advance by check, cash, or credit card ($5.00 minimum). Please make deposits in-person at Blue: The Transit Store (1444 4th St., Santa Monica CA, 90401). Can others request Lyft rides for me? Yes. Caregivers and relatives with access to your Lyft account can request rides for you online, by visiting ride.lyft.com. Please note that you must have a mobile phone capable of receiving text messages in order for them to request your ride online. Can I use my Lyft account to go somewhere else? Yes, but you will be charged regular Lyft rates if you travel outside of the times and places specified in the MODE program. If you have any questions about a specific trip and if it is eligible for a $0.50 fare, please call WISE & Healthy Aging at 310.394.9871. Can I request a MODE ride on standard Lyft or Lyft XL? Not right now. Only rides taken on Lyft Shared qualify for the MODE program. When using the Lyft app or website, be sure to select Shared when requesting a ride. You will be charged full fare for trips taken on any other ride type. For more frequently asked questions, download the MODE FAQ below. Should you have any questions or concerns, please contact WISE & Healthy Aging at 310.394.9871.